A lid adaptor for canning or mason jars, allows people to up-cycle an everyday item into an eco-friendly travel mug. To be used with a regular mouth canning or drinking jar. Made from food-grade recycled plastic, diverting needless waste from landfill. BPA and phthalate free. Twist and go with Cuppow! The lid that transforms glass jars into travel mugs. Canning jars used to be for the domestic god of the kitchen; making jam, preserving apricots and pickling eggs. The invention of Cuppow transforms this sturdy and fashionable-chic jar into a portable drinking vessel. 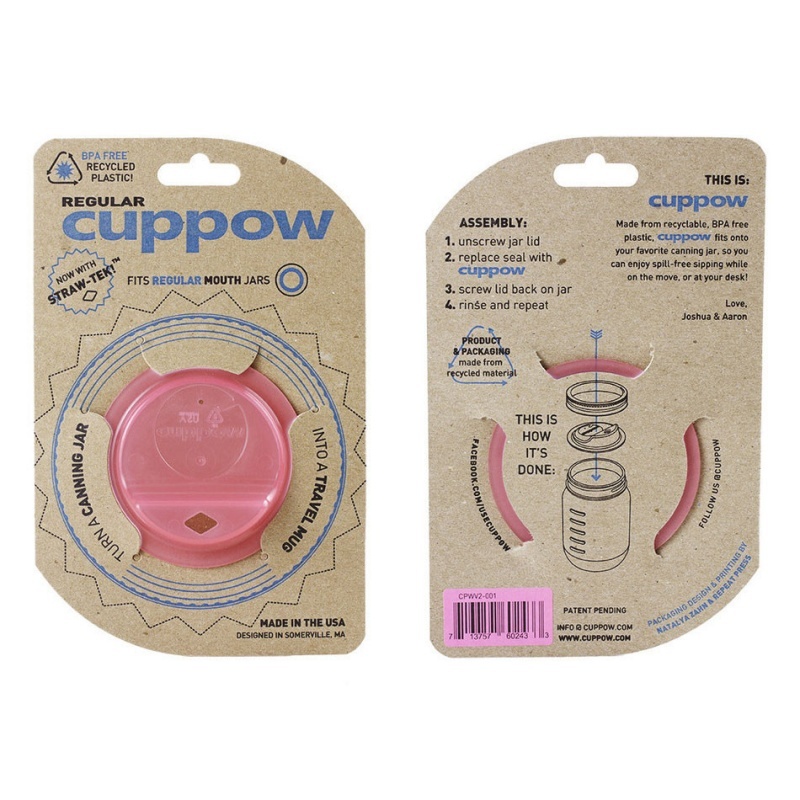 Cuppow is a custom-moulded, BPA free (that's no toxicants in the plastic), a recycled plastic lid that easily transforms a canning jar into a nifty reusable drinking vessel. For those preserving novices, canning jars, also known as mason jars are designed in a clever and useful three part system. First you have the glass cup, this is generally made from hardened glass allowing for temperature ranges from deep freezing to boiling. Next up you have the two-part lid consisting of the thin metal disc, which covers the top of the jar, then finally the screw section that holds the metal disc in place, forming an airtight seal. Cuppow replaces the metal disc, transforming your mason jar into a travel glass. Amazingly versatile once you use Cuppow you'll be taking your canning jar travel glass everywhere. Perfect for venturing out with your morning fresh orange juice, or using as a coffee cup in the office (no more hot drinks spilt over your keyboard), though we do warn you it's best to use a thermal insulator when using hot drinks. Even better, try a sweet, cold ice coffee or homemade lemonade. 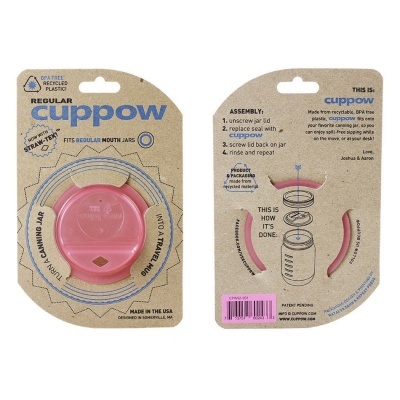 Finally, there's no better spill-proof cocktail glass than Cuppow, whatever tipple tickles your taste buds it will taste better in Cuppow. After you've finished your coffee/juice/soda/cocktail party you'll realise how faultless Cuppow is, no spilt drinks, a unique funky experience and most importantly easy to clean. Just unscrew the lid of the jar, wash and dry, ready for your morning coffee. Can be used with other regular mouth canning jars with a two-part lid. There is an option to purchase this product with or without a compatible handled drinking glass jar, while stocks last. 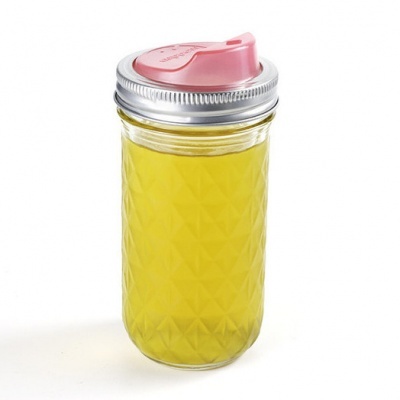 The drinking jar has a handle and is made by Urban Hardware. Choose the Cuppow + Jar option to purchase this product with a jar, while stocks last. 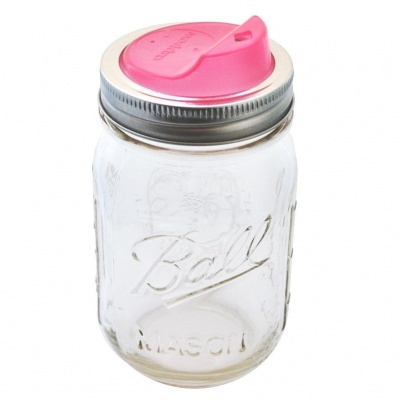 - Handled Drinking Jar offered is compatible, a 1 pint glass drinking jar with two-part lid.